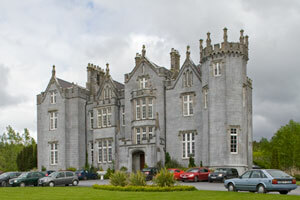 Kinnitty Castle in Offaly is located in the center of Ireland and at the foothills of the Slieve Bloom Mountains. The castle has been made into a 37 room hotel. According to several websites, the property has recently undergone a refurbishment costing 3 million euros. This may explain the positive review in December 2007 on the Trip Advisor travel site which follows several bad reviews.When I stopped in to Kinnitty Castle on my tour in May of 2007, a busy wedding reception was taking place. The setting is beautiful and the guests seemed to be enjoying themselves. 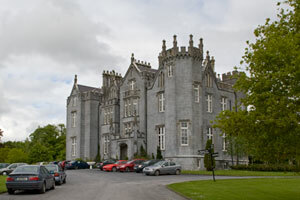 Kinnitty Castle in Offaly has a 60 seat Georgian style restaurant, a drawing room, the Library Bar and two private dining rooms. It has become a popular setting for weddings. The Equestrian Centre offers riding lessons, mountain treks and hunting. Trails go through a 60,000 acre preserve called Kinnitty Forest. The forest is filled with deer, pheasants, badgers, songbirds and foxes. You can ride through wooded areas, open meadows and across streams.Clay pigeon shooting, falconry classes, and tennis are also offered on the estate and fishing and golf trips can be arranged. Hiking trails offer stunning views of the Slieve Bloom Mountains. Kinnitty Castle in Offaly has had a turbulent history. The hotel brochure says that the castle was first built before the 13th century. It was destroyed in 1209 and later rebuilt in 1213 by the Normans. The Gaelic Clan known as the O'Carrolls of Ely later took over. During the Norman control of the castle, an Augustian Abbey was built near the castle. The High Cross and Abbey walls are still standing. William O'Carroll built a new castle close to the Abbey. The English military confiscated the castle in 1641 and renamed County Offaly "Kings County". England granted the castle and the surrounding land to Colonel Thomas Winter in 1664. Colonel Winter's descendants sold the property to the Bernard family in 1764. In 1811 Lady Catherine Hutchinson, wife of Thomas Winter, hired the Pan Brothers, architects of Dromoland Castle and Adare Manor, to plan and build a gothic revival castle. The castle was burned by Republican forces in 1922. It was rebuilt in 1928. The Bernard family lived in the castle until 1946 and then sold it to Lord Decies, who sold it to the State in 1951. The State sold the property to the Ryan family in 1994, who developed the hotel. The hotel brochure doesn't mention that Kinnitty Castle has a reputation for being haunted. It is said that the castle site was once inhabited by Druids, bards and filidhe. 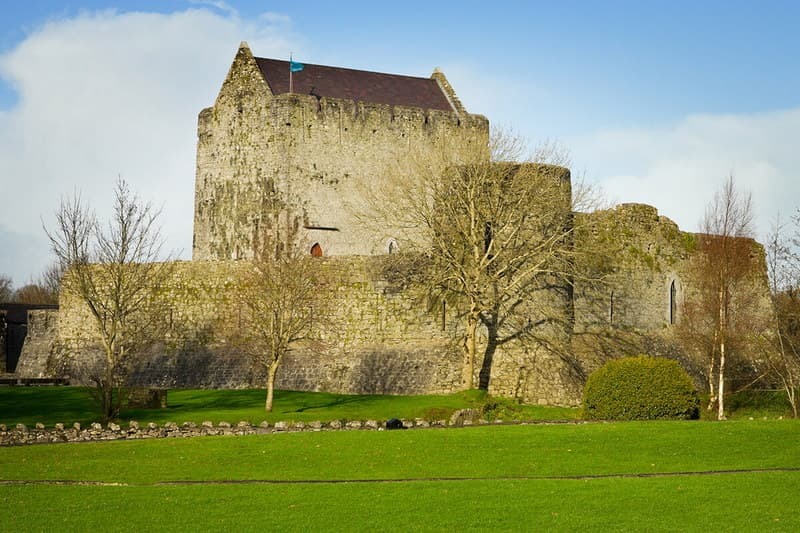 The "Phantom Monk of Kinnitty" has reportedly been seen by staff and visitors as he glides around the castle and stops to look out the courtyard window. He has been known to communicate with staff members and guests, even making many accurate predictions of future events! 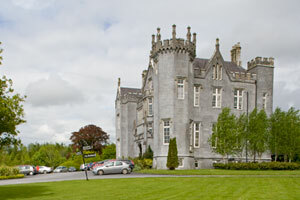 Return from Kinnitty Castle in Offaly to Home Page.